Lucas, S.G. and M. Morales, eds., 1993. The Nonmarine Triassic. New Mexico Museum Of Natural History & Science Bulletin No.3, p. 75-93. ABSTRACT: The palynostratigraphy of the Newark Supergroup basins of eastern North America, particularly for the Newark, Gettysburg, Richmond, and Taylorsville basins, is presented and compared to that of the Chinle Formation and Dockum Group of Arizona and Texas. Seven palynofloral zones are recognized in the Newark Supergroup ranging in age from early Carnian (Late Triassic) to Pliensbachian? (Liassic). Three zones ranging in age from middle Carnian to early Norian are recognized in the Chinle Formation, but only the older two zones are recognized in the Dockum Group. New well data from the Richmond and Taylorsville basins allow the recognition of the Aratrisporites last acme zone, the oldest Carnian palynoflora, as well as the discovery of a Dockum-Chinle palynofacies (late Carnian) within those basins. Evidence is presented for the existence of major climatic and floral cycles on the order of two million years duration. The applications and limitations of taxonomic distribution versus palynofacies succession in age determination and correlation of nonmarine Triassic successions are addressed. The use of palynology in dating and analyzing Triassic strata in North America came of age with the palynofloral study of the Cumnock Formation of North Carolina (Koob, 1961), the paleoecological study of the Petrified Forest Member, Chinle Formation of Arizona (Gottesfeld and Kremp, 1966; Gottesfeld, 1971), and palynological study of the Dockum Group of Texas (Dunay and Traverse, 1971). Contributions to the palynology of Triassic strata in Canada involved mostly Lower Triassic sequences (Jansonius, 1962; McGregor; 1965). As palynology became more popular; additional studies of North American Upper Triassic strata followed in the 1970s (e.g. Schulz and Hope, 1973; Dunay and Fisher; 1974; Gottesfeld, 1972a, b, 1980). Two important and unexpected discoveries came out of these studies: The Moenave Formation of southern Utah and northern Arizona and the youngest strata in. the Newark Supergroup of eastern North America are Early Jurassic in age (Comet, et al.,1973; Peterson, et al., 1977). Previously, the Newark had been considered all Triassic in age, and the age of the Moenave Formation was uncertain. Subsequent palynological studies and publications deal mostly wit:h taxonomy, stratigraphic ranges, and age determination (e.g., Cornet and Traverse, 1975; Dunay and Fisher, 1979, Fisher and Dunay, 1984; Cornet and Olsen, 1985; Traverse, 1986). Doctoral dissertations on the palynolostratigraphy and age of the Dockum, Chinle, and Newark were completed by Dunay (1972); Gottesfeld (1975) and Litwin (1986), and Cornet (1977a), Ediger (1986), and Robbins (1982), respectively. The palynology of subsurface Triassic strata in rift basins of the Gulf Coast depression was published by Moy and Traverse (1986) and Traverse (1987). Palynofloral change at the Triassic-Jurassic boundary in North America has been a hot topic in the Olsen laboratory at Lamont-Doherty Earth Observatory (Olsen and Cornet, 1988; Olsen, et al., 1990; Fowell, et al., in press). Palynofloral turnover in the Carnian and at the Carnian-Norian boundary has also been studied (Cornet and Olsen, 1990; Litwin, et al., 1991). In addition, there have been studies of unusual or enigmatic pollengenera from the North American Triassic (Cornet, 1989a; Zavada, 1990; Litwin and Skog, 1991). There have been macrofossil studies that include in situ spore and pollen taxa (e.g. Ash, 1970; Cornet, 1977b; Ash, et al., 1982; Litwin, 1985; Cornet, 1986; Taylor; et al., 1987; Cornet, 1989b). There have also been studies of Triassic and Jurassic vertebrates of North America that use palynozones as a basis for independent age control and correlation (e.g., Olsen and Galton, 1977; Cornet and Olsen;1985). In North America, most Late Triassic strata are continental in origin, with marine strata restricted to the Early and Middle Triassic of the western United States and Canada. Spores and pollen recovered from Newark Supergroup basins, the Chinle Formation of Arizona and New Mexico, and the Dockum Group of Texas (considered by some paleontologists to be part of and indistinguishable from the Chinle), are the only non-vertebrate tools available for broad as well as focused stratigraphic correlation. Megafossil plants provide coarse zones of correlation across the United States (e.g., Ash, 1975,1980), but megafossil localities are too few and too environmentally controlled to yield anything more than a first order correlation. At best, megafossil plants support or complement vertebrate zonation, but rarely surpass it in resolution. This is usually because the most common plants have longer ranges than vertebrates, and macroplants most useful for chronology are usually more rare as fossils than useful vertebrates. At worst, macroplants are a paleoenvironmental decoration only. Palynology, on the other hand, can provide much more data than megafossils, and can tell us more about upland areas outside basins of deposition than vertebrates can. At best, palynolofloral data can be used to establish local and even worldwide datums of chronologic importance. Palynological data can be checked for sampling error; paleoecological bias, and statistical reliability, because the database typically contains hundreds of species and tens of thousands of records. At worst, palynology is no more accurate in age dating than megafossil plants or vertebrates, because age diagnostic taxa can be too few or not present, floral diversity or change from one area to another was too great, or floral change was not synchronous between study areas. Yet these problems are faced by most paleontologists regardless of specialty. One only has to understand floral and faunal diversity in our world today to appreciate the task of correlating ancient worlds where so much is unknown. Clearly, the paleontological method that has the greatest potential for accurate age determination is the method that employs the most taxa, and palynologists commonly use more taxonomic data than any other specialty. But with increasing amounts of data come complications, making reliance on a few age-diagnostic taxa a frequent practice. The palynological methods and applications presented below are an axample to clarify the benefits and limitations of this relatively young paleontological discipline in studies of North American Triassic deposits. Most of the data presented in this paper come from 20 years of research and investigation by the author; and represent the synthesis of data acquired during postgraduate study - from 1972 to 1977, oil industry drilling in the Newark and data analysis from 1977 to 1988, and academic research from 1988 to 1993. These data are presented in figures 1-10. The only comprehensive palynostratigraphic study done for the Chinle Formation is by Litwin (1986) and Litwin et al. 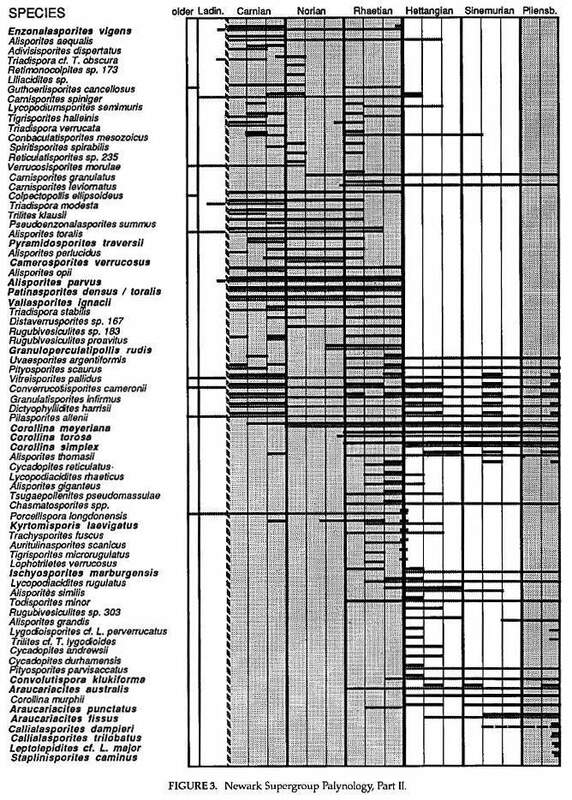 (1991); their ranges for selected age-diagnostic taxa are presented in Figure 4. Detailed palynological studies of the Monitor Butte, Shinarump, and Temple Mountain members, Chinle Formation, and of the Trujillo and Tecovas formations, Dockum, Group, were completed by the author in 1980, and the ranges of selected taxa identified in those studies are presented in Figure 5. They will be used here for comparison with the proposed palynostratigraphy of the Chinle Formation by Litwin et al. 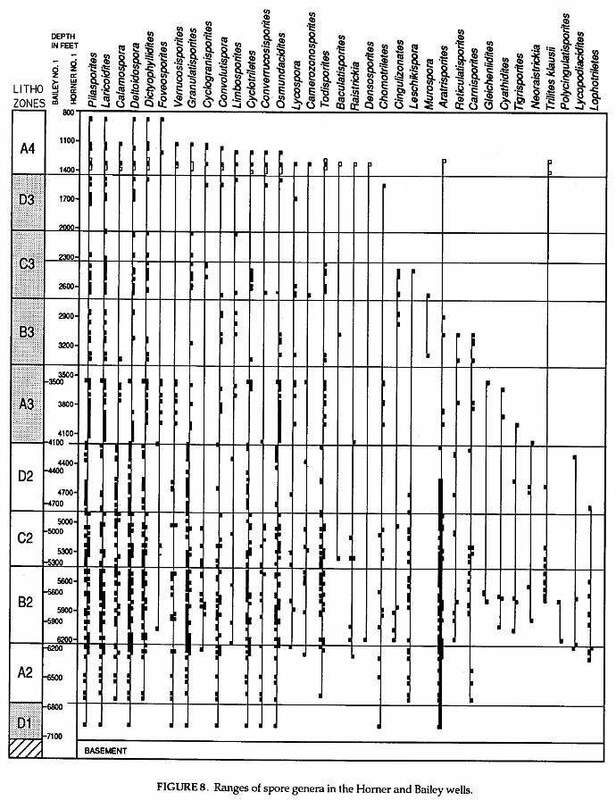 (1991): Figure 1 compares the ages for various basin sections, and indicates the stratigraphic ranges over which the palynological data in Figures 2 and 3 were derived. Correlation between basins was established by Cornet (Cornet 1977a; Comet and Olsen, 1985) through seven palynozanes ranging in age from, miiddle Carnian to Toarcian? Later these ages were refined: early and middle Carnian palynofloras were distinguished in the Richmond-Taylorsville basins by recognizing the Aratrisporites Last Acme palynozone for the oldest early Carnian flora in those basins (zones 4a-4b in Figure 10), A new palynofacies zone correlative with the New Oxford-Lockatong palynozone was recognized in the Taylorsville basin. It is tentatively named the "Chinle-Dockum palynofacies" zone. The Toarcian is excluded for the youngest palynologically-dated Jurassic strata in the Hartford-Deerfield basins, and the Corollina murphyi palynozone (in Cornet and Olsen, 1985), which was found to be the lateral equivalent of the Corollina torosa palynozone, is eliminated. These changes are based on more complete understanding of the palynostratigraphy of the Richmond and Taylorsville basins from recent drilling (cf. Cornet, 1989c; Cornet and Olsen, 1990), and on the analysis of sedimentary cycles in the Hartford and Deerfield basins (Olsen, et al., 1989; Olsen et al., 1992). The Manassas-Upper Passaic palynozone was renamed the Upper Balls Bluff-Upper Passaic palynozone by Litwin et al. (1991) for stratigraphic clarity. The age ranges for the Chinle Formation and Dockum Group are added to complete the correlation of Late Triassic deposits of western and eastern North America. The range for palynological data (black)is based on information provided by S.R. Ash (pers. comm., 1975) and by Litwin et al. (1991) for the Chinle Formation, and by R.E. Dunay (Dunay and Fisher (1979) and the author for the Dockum Group. All samples used to obtain data for these figures were processed using standard palynological techniques. The Newark Supergroup data were compiled from Cornet (1977a), Cornet and Olsen (1985), and unpublished non-proprietary data acquired by Cornet for the Richmond and Taylorsville basins. Relative ranges of identified palynotaxa within the Newark Supergroup in black (upper line of pair) are compared with known ranges in age of the same taxa in gray (lower line of pair) outside the Newark. Several taxa which are identified only to genus or are restricted to the Newark are shown as black lines only. Taxa highlighted in bold print represent some of the most important age-diagnostic taxa in the Newark Supergroup. Newark ranges are based on the chronostratigraphic succession of distinct palynofloras. Periods of major origination and extinction represent datums or events of chronostratigraphic significance. Relative age is based on a best fit method, which seeks the least number of age-diagnostic Newark taxa whose ranges do not fall within their ranges outside the 'Newark Supergroup'. Concurrence of taxa in successive palynological samples (palynoflorules) requires that occurrences of taxa outside their normal age range or in uncommon association with other taxa be recognized as anomalous. No species are given more age significance than others in determining age. Instead, the entire palynoflora is weighted so that anomalous ranges, which might indicate a different age to some palynologists, can be placed in proper perspective. Age information outside the Newark Supergroup for recorded taxa was obtained from the following sources. Because of space restrictions and the fact that these sources can be tracked through the References, only those which are cited in the text appear as full citations at the end of this paper: Balme, 1957; Balme; 1963; Balme and Hennelly, 1955; Batten, 1968; Bharadwaj and Singh, 1963; Brugman, 1983; Clapham, 1970; Clarke, 1965; Couper, 1953; Couper, 1958; Danz�-Corsin and Laveine, 1963; De Jersey, 1959; De Jersey, 1962; De Jersey, 1963; De Jersey, 1971; De Jersey, 1973; De Jersey and Paten, 1964; Dunay and Fisher 1979; Filatoff, 1975; FisheIi 1972; Fisher and Dunay, 1984; Herngreen, 1974; Herngreen and De Boer, 1974; Jain, 1968; Jansonius, 1962; Klaus, 1960; Klaus, 1964; Leschik, 1955; Litwin, 1985; Lund, 1977; M�dler, 1964a; M�dler, 1964b; Malyavkina, 1964; Morbey, 1975; Nilsson, 1958; Pautsch, 1971; Pedersen and Lund, 1980; Playford and Dettman, 1965; Pocock, 1962; Pocock, 1970; Pocock and Vasanthy, 1988; Reiser and Williams, 1969; Scheuring, 1970; Schulz, 1967; Schuurman, 1977; Scott, 1960; Srivastava, 1987; Stover, 1964; Venkatachala and Go�z�n, 1964; Visscher; 1966; Volkheimer and Zavattieri, 1985. Figure 4 is based on the work of Litwin (1986), and is modified from Figure 3 in Litwin et al. (1991): ranges have been given different patterns to aide in distinguishing coeval groups of taxa that may have different times of origination in the Chinle Formation. Unlike previous investigations, Litwin's study includes productive samples from the upper Chinle Formation. Names have been changed omitted where there is disagreement on identity: Cycadopites stonei is replaced by Granamonocolpites luisae, and Heliosaccus dimorphus is not shown, because it is considered to be either a morphological variant of Patinasporites densus or a related Patinasporites species that has not been separated from P. densus in Newark Supergroup studies by the author. The ranges presented in Figure 5 are based on the study of samples collected by the author, by R. Dunay and A. Traverse (Dunay, 1972), or by S. Gregory (1950) for the Dockum Group, or were given to the author by S.R. Ash (pers. comm., 1975) for the Chinle Formation. The stratigraphic arrangement of the samples is an interpretation based on field observations and/or data provided by the collectors. Only the Dockum Group samples are itemized below, because they include samples collected by the author. Until cores are taken which show the actual stratigraphic displacement between sample localities, there is possible error for samples taken from different geographic areas. The Home Creek samples (HC4-8a), for example, were taken from one area near Kalgary, TX, and are probably in correct stratigraphic order. The relative stratigraphic positions of the Masten Ranch (3A7: Oldham Co.) and Bush Ranch (PC2: Potter Co.) samples, however; are estimated according to map position and outcrop disposition. 7b Sunday Canyon, north rim, above Sanmiguelia locality (Cornet, 1986); 2 miles west of main entrance into Palo Duro Canyon State Park, Randall Co., TX. ColI. by B. Cornet with E. Murray and A. Santa-Luca in 1980; may be equivalent to sample 7A of R.E. Dunay (Dunay and Fisher, 1979). Palo Palo Duro Canyon State Park, 2 miles east of park entrance, Randall Co., TX; sample 9A of R.E. Dunay (Dunay and Fisher, 1979). PC2 Bush Ranch, Potter Co., TX; coll. by Gregory in 1950. Sample from Harvard paleobotanical collection. 3A7 Matsen Ranch, near mouth of Trujillo Creek, Oldham Co., TX; sample 3A of R.E. Dunay (Dunay and Fisher, 1979). HC5 Home Creek on Humble Ranch, near Kalgary, Crosby Co., TX. Coll. by B. Cornet with E. Murray and A. Santa-Luca in 1980. HC4 Home Creek on Humble Ranch, near Kalgary, Crosby Co., TX. Coll. by B. Cornet with E. Murray and A. Santa-Luca in 1980. Tule Tule Canyon, 2 miles east of Texas Highway 207, Briscoe Co., TX; sample 5A of R.E. Dunay (Dunay and Fisher; 1979). HCBa Home Creek just east of Humble Ranch, Crosby Co., TX. Coll by B. Comet with E. Murray and A. Santa-Luca in 1980. HC7-2 Home Creek just east of Humble Ranch, Crosby Co., TX. Coll. B. Cornet with E. Murray and A. Santa-Luca in 1980. HC7-1 Home Creek just east of Humble Ranch, Crosby Co., TX. Coll. B. Cornet with E. Murray and A. Santa-Luca in 1980. These samples were processed using standard palynolog ical techniques. The author's samples from the Chinle Formation come from the Sonsela Sandstone and lower Chinle, while those from the Dockum Group represent all but the oldest and youngest strata in that group. Additional records in Dunay and Fisher (1979) and Fisher and Dunay(1984) for the Dockum and Chinle (see locality data) have been added to my records for the Dockum. The Petrified Forest sample of Fisher and Dunay (1984) has been added to the Chinle data, and ranges for taxa given by Litwin et al. (1991) for the Chinle Formation (striped lines) are provided for comparison. The Horner No.1 well (T.D. 6,386 ft. drillers depth) was spudded in July and the Bailey No.1 (T.D. 7,443 ft. drillers depth) in September of 1981 by Cornell Oil Company / Geminoil, Inc. of Dallas, TX and Houston, TX, respectively. These two wells provide the first comprehensive knowledge of early Carnian stratigraphy in eastern North Armerica during the initial phase of rifting. Since the lower part of the Upper Triassic is important for the correlation of Triassic sequences in North America, the stratigraphic data base for Richmond basin palynology is given. These two wells were drilled about six miles from one another along strike near the depocenter or deepest part of the Richmond half-graben (see Cornet, 1989a for map). Gamma ray and shallow resistivity logs for the Horner and Bailey wells were traced and reduced to fit on one page. Depths are shown in feet. Sandstones are colored white, all finer-grained clastic sediments (siltstones to claystones) are colored black, and coals are given a checkered pattern. Letters above and below correlation lines represent lithofacies (systems tract) intervals. These intervals show a repetitious sequence of facies B (dominantly fine grained) through D (dominantly coarse grained), followed by a mixed interval (facies A)which is transitional between D and B. The last fluvial sequence D is succeeded by facies E, which represents a modified facies A following a major shift in channel position at about 1420 ft. Correlation between the wells is based on matching about 60 upwards-coarsening sedimentary cycles which average about 90 ft in thickness (thought to represent the climatically forced 400,000 yr. eccentricity cycle of the equinox), on correlating facies packages A-E, on recognition of major or sudden facies shifts across the basin (e.g., at about 4300 ft and at about 2200 ft), and on palynology (Fig. 10). Faults are represented by gaps in the logs; their recognition is based on anomalous dips on dipmeter logs and/or on sections which cannot be correlated between the wells. Paleoenvironmental interpretations are based on lithology coupled with kerogen and palynological content (Cornet, 1989a). Note that most finer-grained sediments in the lower half of the wells are mixtures of dark gray to black claystones and gray to black siltstones, while most finer-grained sediments in the upper half are brown to gray siltstones, with only thin gray to black claystone interbeds. Organic content increases in shales and siltstones with depth to a maximum within the productive coal measures. Facies correspondence between wells increases with depth as facies change from dominantly fluvial above to dominantly deep lacustrine below. The disconformity at about 4300 ft. is based on seismic correlation and on palynofloral change. Updip this disconformity changes to an angular unconformity at the tops of rotated fault blocks (seismic data), where significant amounts of section can be missing below the unconformity and where a condensed section occurs above it (well data). In the wells reworked palynomorphs and woody debris were recognized above this disconformity by their higher thermal maturity, along with the occurrence of common fusinite. These data (Figs. 7,8) are based on the study of 95 cuttings samples from the Horner No.1 well and 75 composite cuttings samples from the Bailey No.1 well. Most (76%) of the Horner samples were 30 ft composites, but 31 ten ft samples and 10 twenty ft composites were used in the Horner well. All samples for the Bailey well were 30 ft composites. 10,336 palynomorphs were counted for the Horner No.1 (average 108.8 per slide), and 11,756 palynomorphs were counted for the Bailey No.1 (average 156.7 per slide). Counts were made until fifteen non-overlapping traverses were completed on each slide or until at least 200 palynomorphs were counted, whichever came first. About 29% of the samples for both wells had counts of more than 200. However; 54% of the samples had less than 100 counts for the Horner well, while half that percentage (27%) of samples had less than 100 counts for the Bailey well. 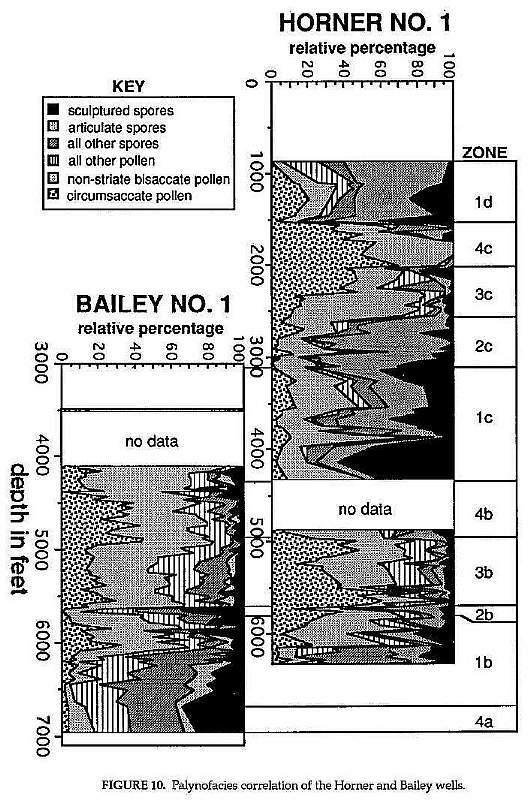 This is in part due to the fact that 58 samples in the Horner well came from the upper part of the section, which was mostly barren in the Bailey well (facies change to mostly sandstones and brown mudstones), and all but one sample in the Bailey came from the more organically rich lower part of the section. Black squares on. the left side of each line represent Bailey No.1 records, while black squares on the right side represent Horner No.1 records. Open squares represent data from the J.R. Hicks No. 1 well drilled up dip to the east of the Horner well (Cornet, 1989a), while X-marks represent outcrop data that give the lower extent of ranges where well data are incomplete. Correlation between the Horner and Bailey wells (offset depth scales) is based on lithostratigraphic correlation in Figure 6. Genera haye been arranged to show increasing depths for tops of ranges in the Horner and Bailey wells, but also what happens when additional well data are included (i.e., Hicks data). One species name-(i.e:, Trilites klausii) is given where the record is exclusively of that taxon, and where the form genus name has little morphological value, Late Triassic species of these genera are listed in Figures 2 and j and can be found in the references cited. These data are (Fig. 9) based on the study of 95 cuttings samples from the Horner No. 1 well. Most samples represent 30 foot composites, but 31 ten foot samples and 10 twenty foot composites were also used where shaley intervals were thin. 10,336 palynomorphs were counted for the Horner No.1 (average 108.8 per slide). Counts were made until 15 non-overlapping traverses had been completed on each slide or until at least 200 palynomorphs were counted, whichever came first. The lower curve for # grains represents the average count per traverse of a slide. Nineteen percent (19%) of the samples (slides) had 200 or more counts, while 54% had under 100 counts due to sparse residues. Palynotaxa were identified according to genus and morphotype, and placed in one of six categories: circumsaccate, nonstriatebisaccate, all other pollen, articulate spores, sculptured spores, and all other spores. These six categories were graphed according to the top depth for each sample. The number of counts per slide were also graphed to show relative reliability for percentages counted. Samples with under 100 counts per slide have significantly lower probability of being duplicated by other slides for the same sample interval than samples with over 200 counts per slide. This does not mean that these counts are unusable, only that small variations from sample to sample in a zone with low counts are less significant than are small variations from samples to sample in a zone with high counts. The counts were smoothed by averaging over three samples and then over 13 samples. The lower two graphs snow what would happen when larger and larger sampling intervals are analyzed. The middle graphis the kind of resolution expected (but not necessarily achieved when counts per sample are below 300) for 90 ft composite samples commonly used in the oil industry. The lower graph shows the major palynofloral trends and reveals what is considered to be a floral/climatic cycle on the order of approximately 2 million years (Fowell et al., in press). Count reliability increases as the number of counts per slide are added together for larger and larger sampling intervals. It should be noted that with composite samples that are 13 times an average of about 20 ft (260 ft intervals), the number of counts required to reproduce this graph has increased from an average of 107 counts per sample interval to 1390 counts per sample interval. A count of 200 for that same 260 ft interval, or for any interval over 10 ft, decreases by the inverse of interval thickness the reliability of that count from being duplicated with another sample of that interval. In other words, there are no short cuts to reliable data, and the smaller the sample interval the higher the resolution and reliability of the results. These graphs (Fig. 10) repreprent the same analysis for both wells as was done for tile Honer well in Figure 9. See the descriptibn above for Figure 8 for details on the number and interval thicknesses of samples used in these two wells. Palynozones 4a to ld have been established based on gross compositional uniformity. These zones appear to change upwards in a cyclical fashion that reflects the frequency of the megacyle portrayed in the lower diagram of Figure 9. Each megacycle has been designated a lower case letter (a-d), and each zone within that megacycle a sequential number from one to four: These megacycles correspond to the lithozones (Dl-A4) estab- lished in figures 6-8, which are identified according to number (1-4) with subzones given capital letters (Figure 6). Floral megacycles a+b (zones 4a-4b) define the range of the Aratrisporites Last Acme palynofloral zone in Figure 1, (see Ediger, 1986). Correlation between the Horner and Bailey wells was accomplished by palynozones. Close correspondence exists between the two wells for the overlapping palynologically productive parts of the sequence. Some difference occurs with percentages of circumsaccates, which seem to replace mostly the nonstriate bisaccates in percentage. Such difference is interpreted as a reflectIon of proximity to Patinaspontes/Vallasporites producers on prograding deltas, and thus to local facies change. The lack of overlap between 4100 it in the Bailey well and 4300 it in the Horner well is considered to be a combination of facies difference and sampling error. There is only one sample in the Horner well for comparison with about five successive samples in the Bailey well. Most Newark Supergroup palynotaxa have ranges that coincide with or occur within their ranges recorded outside the Newark. Notable exceptions are: Acanthotriletes varius, Alisporites perlucidus, Colpectopollis ellipsoideus, Lophotriletes verrucosus, Lycopodiumsporites semimuris, Lycospora imperialis, Lygodioisporites cf. L. perverrucatus, Microcachryidites doubingeri, Polycingulatisporites mooniensis, Rugubivesiculites proavitus, Spiritisporites spirabilis, Tigrisporites dubius, Triadispora cf. T. obscura, Trilites cf. T. lygodioides, Trilites cf. T. verrucatus, and Tigrisporites microrugulatus. Identifications are certain, but age ranges given in Figures 2 & 3 overlap little or not at all their known ranges outside the Newark Supergroup (lower lighter lines of a pair in those figures). In most cases, the gap in age range is minimal, and can be attributed to an incomplete knowledge of range outside the Newark. In some cases, however, the gap is considerable. For example, Microcachryidites doubingeri and Colpectopollis ellipsoideus were initially identified in strata older than Ladinian, but their frequent occurrence in Carnian and/or Norian-Rhaetian strata indicates that they cannot be reworked. These are cases where the ranges of these taxa must be extended, particularly if there is no morphological way to distinguish them from their counterparts in the Early and Middle Triassic. et al., 1991). Camerosporites verrucosus, for example, is usually a good index for Norian age strata where it replaces all other Camerosporites species. But this species has been found as a rare element of some Carnian and Rhaetian palynoflorules, and the transition to C. verrucosus dominance in the Norian is gradual at the Carnian/Norian boundary. Placing more weight on this taxon than on other more numerous associated taxa could necessarily give an erroneous age interpretation. The youngest ages for Newark Supergroup strata are no, as certain as Figures 1-3 might indicate. Yes, the concurrence of Araucariacites australis, A. punctatus, A. fissus, Callialasporites dampieri, C. trilobatus, Leptolepidites cf. L. major, and Staplinisporites caminus in Europe strongly indicate a late Liassic or younger age (Srivastava, 1987). However, cyclostratigraphy for the lower Portland Formation recently demonstrated the possibility that the lower palyniferous part of that formation spans as little as 2 million years, making even a Sinemurian age for the youngest Jurassic strata in the Newark a potential stretch of the data. Little work has been done on the magnetostratigraphy of the Portland Formation, and until numerous reversed intervals can be demonstrated as occur throughout the Liassic, the age of the Portland Formation will remain in doubt. Because some of these taxa (e.g., Callialasporites dampieri) have been recorded near the paleoequator during the Hettangian (Reyre, 1973), it is possible that the above taxa represent a precocious flora. Since the Hartford basin was located near the paleoequator during most of its depositional history (Witte et al., 1991), a northward migration of this flora in the late Liassic from near its place of origin cannot be discounted. Palynological studies of the Chinle Formation and Dockum Group (Figs. 4,5) demonstrate that: 1) many taxa range through most of the section, indicating little passage of time compared with the Newark Supergroup (Figs. 2,3); 2) at best the palynofloras can be separated into three distinct floras (Litwin et al., 1991); and 3) the Dockum and Chinle sequences of rock are approximately coeval, supporting previous indications from vertebrate paleontology. About 160 palynomorph taxa were recognized in my study of the Chinle Formation and Dockum Group. Of these, 80 taxa were identified to species. Forty eight of them are shared with the Newark Supergroup, of which 45 are shown in Figures 2-3. The remaining 32 identified species are either restricted to the Chinle and/or Dockum, or have not yet been identified in the Newark. Most of the remaining 80 taxa have been identified to genus. Of these, at least 12 are present in the Newark as new or unnamed species, bringing the total number of taxa shared between eastern and western North America to 60. The oldest strata of both the Chinle and Dockum contain higher percentages of striate bisaccate pollen than younger strata. This zone is called Pollen Zone 1 in the Chinle Formation by Litwin et al.(1991). The presence of Lunatisporites noviaulensis, Infernopollenites claustratus, and Parillinites pauper together in some of these basal strata (particularly in the Dockum Group: Fig. 5) indicates a possible correlation with the Chatham- Richmond-Taylorsville palynoflora of the Newark Supergroup (Fig. 1). This correlation is based not so much on the presence of these taxa.in the C-R-T palynoflora (only E. pauper is shared), but on the fact that striate bisaccate pollen is about as common in the C-R-T palynoflora as it is in Litwin's Pollen Zone 1, and it is rare or absent in overlying palynofloras of both western and eastern North America. At the very least, these taxa, when they occur together and not as rare elements, may be useful in distinguishing the oldest strata of the Chinle and Dockum from younger strata. The youngest strata palynologically dated for the Chinle Formation (Litwin et al., 1991) appear to be younger than the youngest strata preserved (sampled?) in the Dockum Group. The presence of Camerosporites verrucosus and Kyrtomisporites spp. only above the Sonsela Sandstone in the Chinle supports Litwin's Norian age assignment. These taxa are absent, however; from the youngest sampled palynoflorules of the Dockum Group. The common occurrence of Pyramidosporites traversii and the presence of Guthoerlisporites cancellosus in the youngest Dockum palynoflorules corresponds to similar occurrences of these taxa near the Carnian-Norian boundary in the Newark Supergroup (near or at the Graters Member: Cornet, 1977a), implying that most of the late Carnian is preserved in the Dockum Group. How much younger than Norian the Chinle Formation becomes is unclear, because the youngest strata (i.e., Redonda Member) have yet to be studied palynologically. Lucas (pers. comm., 1993) thinks that these strata, based on vertebrate assemblages, may be as young as Rhaetian. Detailed palynological study of the Richmond basin sequence (Fig. 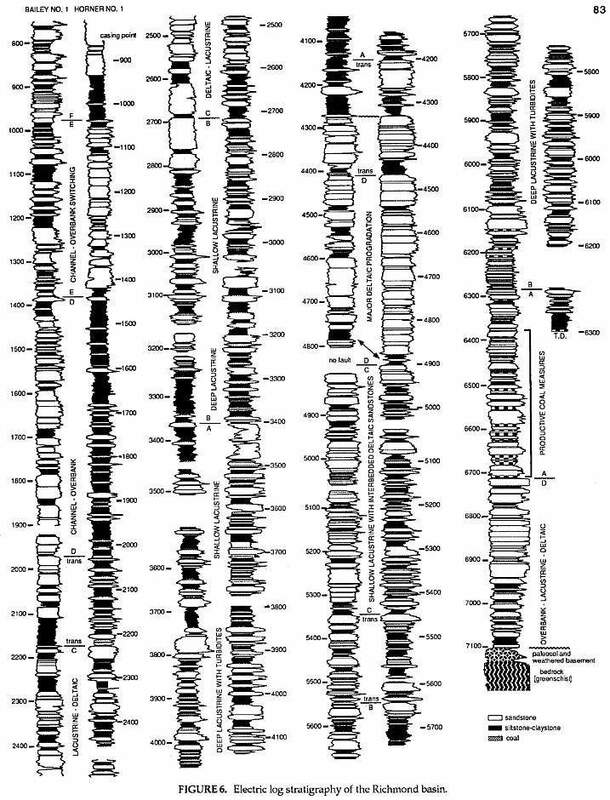 6) indicates that this thick sequence covers a short period of geologic time (less than 5 million years: Fig. 1). Because it contains no datums of major floral turnover (Figs. 7- 8), taxonomic correlation within this sequence is limited by the few taxonomic ranges that begin and/or end within the sequence. It can be successfully correlated and age dated, however; by the succession of ten distinctive palynofacies (Fig. 10). Success using palynofacies requires, however, a long or thick time sequence with few diastems and unconformities (i.e. missing time). The distribution of spore and pollen genera within the Richmond basin section (Horner and Bailey wells) demonstrates just how unreliable ranges of taxa can be in one well or outcrop sequence because of local palynofacies differences (Figs. 7-8). Although palynofloral diversity seems to increase with depth, most species that seem to disappear up section in the Horner and Bailey wells have been found in younger strata (e.g., Hicks No.1 well, Richmond basin; in proprietary cores, Taylorsville basin; and in outcrop samples containipg younger palynofloras in the Deep River basin). Notable exceptions are given below. Some taxa or genera are much more common in one well than in another through coeval sequences, implying that tops and bottoms of ranges are mostly artificial. With the addition of data just from the Hicks well (open squares, figures 7-8), some ranges are extended considerably. Proprietary data from the Campbell core hole in the Taylorsville basin can't be presented, but if included would show that most of these genera and species range to the top of the section (i.e., Lithozone A4). The analysis of the Horner and Bailey wells by pollen and spore morphotypes instead of taxa reduces the number of categories for comparison, identifies major changes in relative abundances of some morphotypes as all indicator of facies change, and identifies major trends in facies evolution through the sequence. By this method one can recognize clearly and unambiguously three separate zones dominated by spores, which are separated by zones that become progressively more pollen dominated upwards. These megacycles of approximately 2600 ft. in thickness (Figs. 9,10) show a repetition of floral change from spore rich to pollen rich, with reversals of shorter duration (21,000 yr. to 400,000 yr. cycles) within each megacycle. Because floral diversity appears to be cyclic in the Newark Supergroup, absolute tops or last occurrences cannot be confirmed until the succeeding period of high diversity is studied in detail. This is because common taxa can drop out during periods of low diversity; but reappear as rare elements during the next floral cycle or "bloom". These cycles correlate well with changes in lithofacies from sand and silt dominated to silt and clay (or mud) dominated back to sand and silt dominated at the top. The lithofacies and palynofacies in turn reflect climatic changes from dominantly wet with moderate rainfall to dominantly wet with high rainfall to dominantly dry with low rainfall. The palynofacies also reflect the size and depth of lakes that developed within the basin (Cornet, 1989a; Cornet and Olsen, 1990); Deep lakes caused by high annual rainfall restricted or eliminated lake margin facies that supported fern and cycadophyte communities, resulting in palynoflorules dominated by diverse bisaccate and circumsaccate pollen from the uplands. Shallow lakes during moderately wet periods allowed extensive fern and lycopod-dominated environments to exist along the lake margin. Shallow lakes with silty substrates promoted the development of extensive articulate-dominated communities around the lake margin. Shallow lakes during relatively dry periods promoted the development of extensive conifer-dominated communities around the lake margin (Cornet, 1993). These latter facies are typically dominated by sandstone and siltstone, and represent deltaic and lake margin facies that prograded into the basin during times of low lake stands. Thus, the palynograms in Figs. 9 and 10 represent the integration of environmental and climatic changes throughout the history of deposition in the basin. Correlation using palynofacies is possible in the Richmond basin because the composition of each floral megacycle (a-d), particularly the lower spore-dominated zones (Fig. 10: zones 1b, 1c, and 1d), are radically different (Cornet and Olsen, 1985). Palynozone 1b is dominated by lycopod spores (mostly Aratrisporites spp.) and cycadophyte pollen (Cornet and Olsen, 1990), whereas palynozone 1c is dominated by sculptured spores with relatively high percentages of psilate spores, and palynozone 1d is dominated by articulate (horsetail) spores. These differences have also been recognized in Taylorsville basin outcrop samples (Cornet and Olsen, 1990) and cores (Campbell No.1) that correlate with all but the oldest and youngest Richmond basin strata. The upper pollen-dominated portions of each megacycle are more difficult to distinguish, because less floral evolution can be detected in the uplands during this period of time, and because the conifer and cycadophytes that lived within the basin during lake low stands produced conservative pollen types that reveal little about evolutionary changes in the parent plants. That is why samples from lithozones C3 and C2 look a lot alike. If it were not for rare and distinctive pollen types such as the angiosperm-like pollen (i.e., Tricrinopollis spp., Pentecrinopollis spp., and Monocrinopollis spp.) that occur in the Richmond and Taylorsville basins (Cornet, 1989a), palynozones 3c and 3b, for example, might not be distinguishable, except in sequence with the spore-dominated palynozones. The boundary between floral megacycles b and c defines the boundary between the Aratrisporites Last Acme and Chatham-Richmond-Taylorsville palynozones, but the boundary between the C-R-T and New Oxford-Lockatong palynozones occurs within megacycle d (probably just above the top of 1d). Above the Cumnock Formation in the Deep River basin (equivalent to lithozone A4 (= ld) in the Richmond and Taylorsville basins) there appears to be an abrupt transition to unpalyniferous red mudstones and brown sandstones (basal Sanford Formation). This transition may have been caused by a rapid deterioration of the climate to more arid conditions, which in turn could have been responsible for the extinctions at the top of the C-R-T palynozone. Those taxa which are distinctive in the upper part of the C-R-T palynoflora (middle Carnian), and are useful for distinguishing it from the NO-L palynoflora (late Carnian) include: Aratrisporites fimbriatus, Cyclotriletes margaritatus, C. microgranifer, C. oligogranifer, Lagenella martinii, Lunatisporites acutus, Lycospora imperialis, Neoraistrickia americana, Placopollis koobii, Protohaploxypinus spp., Raistrickia crassiornata, Raistrickia grovensis, and Striatoabieites aytugii. Only Placopollis koobii and Neoraistrickia americana are endemic to the Newark Supergroup. Placopollis and Striatoabieites are common enough to be reliable age indicators. The remaining taxa, however, are usually rare except in some palynofacies. Because some of them, such as Tigrisporites dubius, have very different ranges outside the Newark (Figs. 2,3), their scarcity make them unreliable indicators of age in isolated samples. For example, one specimen of C. oligogranifer was found out of place in the NO-L zone in the Taylorsville basin. The major turnover with local disappearances and extinctions at the end of the Chatham-Richmond-Taylorsville palynofloral zone (middle Carnian) involve at least 37 taxa (Figs. 2,3; revised from Cornet and Olsen, 1990). Thirteen (13) of these taxa survive the Carnian outside eastern North America, and four (4) of them reappear in much younger strata of the Newark Supergroup. At least twelve (12) taxa that disappear in the Newark continue into upper Carnian strata of the Dockum and/or Chinle (Fig. 5; Dunay and Fisher, 1979; Fisher and Dunay, 1984). They are: Baculatisporites comaumensis, Convolutispora microfoveolata, Cyclotriletes microgranifer, Cyclotriletes margaritatus, Daughertyspora. chinleanus, Falcisporites gottesfeldii, Leschikisporis aduncus, Lunatisporites acutus, Osmundacidites welmanii/senectus, Polycingulatisporites mooniensis, Protohaploxypinus spp., and Protodiploxipinus fastidiosus. However, eleven (11) taxa, which are usually absent in the New Oxford-Lockatong palynozone (late Carnian) of the Newark/ Gettysburg basins, are present in that time period in the Taylorsville basin to the south (cuttings samples from 2110 ft to 2550 ft in the Wilkins No.1 well; top Triassic at about 1700 ft in that well). They are: Bharadwajispora jansonii, Camerosporites verrucosus, Corollina meyeriana, Cyclotriletes oligogranifer, Falcisporites oviformis, Klausipollenites vestitus, Kyrtomisporis laevigatus, Pityosporites devolvens, Pityosporites neomundanus, Pityosporites scaurus, and Rugubivesiculites proavitus. The extreme similarity in taxonomic and percentage composition between palynofloras from the upper Taylorsville basin sequence (above 5700 ft in the Wilkins No.1 well) and the Dockum/Chinle sequences (Fig. 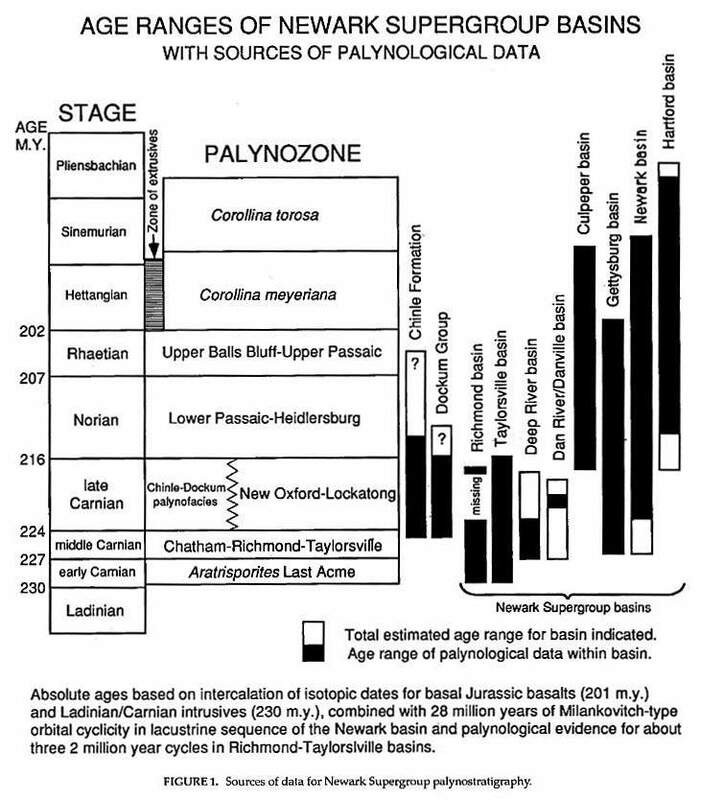 5) implies the existence of a palynozone separate and distinct from the New Oxford-Lockatong palynozone of the Newark/Gettysburg basins to the north. The new floral zone is tentatively named the Chinle-Dockum palynofacies zones. The transition between this zone and the overlying Lower Passaic-Heidlersburg palynozone (2110 ft, Wilkins well) is preceded by a gradual and finally permanent replacement of Camerosporites secatus and C. pseudoverrucatus by C. verrucosus over a stratigraphic interval of about 500 feet (in the Taylorsville basin), along with an increase in large bisaccate and circumsaccate pollen percentage and diversity at the expense of small bisaccate pollen. The discovery of palynoflorule assemblages in the Taylorsville basin that could have come from the Chinle or Dockum implies the existence of a flora that characterizes Chinle-Dockum type paleoenvironments. This is important, because until this discovery the differences between the floras of eastern and western North America seemed to be caused by provinciality and distance, not environment. The geographic separation of the Newark/Gettysburg basins and the Tayorsville/Richmond basins is the narrow width of the state of Maryland. That distance cannot explain the strong dominance(58%-78%) by Klausipollenites spp., Protodiploxypinus americus, and Triadispora dockumensis (all small bisaccate morphotypes) in the Taylorsville basin, in contrast to the dominance of larger Triadispora spp. (T. dockumensis rare) and Patinasporites densus in the Newark and Gettysburg basins. While the Triassic part of the Newark Supergroup covers almost all of the Upper Triassic (about 28 million years), the palynologically dated parts of the Chinle Formation and Dockum Group cover mainly the late Carnian and early Norian (about 10 million years). Whereas the Late Triassic part of the Newark contains five palynozones and at least two datums of significant extinction or taxonomic turnover (one at about 224 Ma and the other at about 202 Ma: Fig. 1), the Chinle Formation currently contains only three recognizable palynozones, and the Dockum Group only two. Although a Carnian-Norian floral transition is recognizable in the Chinle and Newark, it is not considered to be of major significance - certainly no more significant than the taxonomic changes between floral megacycles of the Richmond basin or between most of the palynozones in the Newark Supergroup. One of the most significant recent developments in the study of Triassic floras of North America is that the Chinle- Dockum flora may have extended across the continent to the Richmond-Taylorsville basins during the late Carnian. To the north of this sinuous floral belt was a distinct flora characteristic of the lacustrine-deltaic Lockatong and New Oxford formations of the Newark and Gettysburg basins. It extended south of the Richmond-Taylorsville basins only in the narrow Dan River/Danville basin rift, where deep lakes existed during the late Carnian (Olsen et al., 1979; Robbins and Traverse, 1980; Robbins, 1980; Cornet, 1993). The similarity of the sediments containing this flora (mottled red beds, common fluvial channels, and thin gray-black clay tenses) and the dominance of the palynoflora by small bisaccate pollen imply climatic and environmental control. It may be of interest that the Otterdale Sandstone, the uppermost formation of late Carnian age in the Richmond basin (Cornet and Olsen, 1990), contains in some outcrop zones very abundant silicified logs of the Araucarioxylon type. If these zones were exposed to and eroded in a climate like that in Arizona today, we might have a petrified forest on the East Coast that resembles the Petrified Forest of Arizona (Shaler and Woodworth, 1899). Correlation of unknown samples with anyone of the palynozones established for the Newark, Chinle, or Dockum is dependent on taxonomic as well as morphologic (percentage) composition. The more palynological samples analyzed in a given section and the larger the palynomorph counts per sample, the higher the probability of successful correlation. The variability in taxonomic composition of sampled intervals throughout any section, and the occasional occurrence of diagnostic taxa out-of-place, makes correlation based on single or isolated samples very risky, even when diagnostic taxa are present in relative abundance. The recent dating of a single core sample from the southern part of the Taylorsville basin as early Norian by Litwin and Weems (1992) points out such risk, particularly when used to distinguish between conflicting structural models. That basin contains at least 11000 ft of strata, only the youngest of which are Norian in age (see above). The southern outcrop belt, where Litwin's Ashland No.1 coresample was taken, is dominated by the oldest strata in the basin. Litwin and Weems (1992) may have sampled a thin veneer of Norian strata preserved in erosional channels carved into much older Carnian strata. An erosional unconformity of similar magnitude and form exists in the Richmond basin (Cornet and Olsen, 1990). Litwin and Ash (1993) recently revised the biostratigraphy of the Deep River Basin, and placed the upper part of the Chatham-Richmond-Taylorsville palynozone in the late Carnian. Litwin found Camerosporites verrucosus (usually a Norian age indicator) in the middle Pekin Formation (PK2), and concluded that it must therefore be younger than middle Carnian (however, see Fig. 3). Their age revision does not invalidate the C-R-T palynozone, but brings into question how age assignments are made. They also demonstrate that C. verrucosus occurs well down into the Carnian, contrary to earlier claims (e.g. Litwin et al., 1991). They use the similarity in vertebrate assemblages between the upper Pekin-Cumnock formations and the Chinle Formation to support a late Carnian age, apparently not realizing that vertebrate paleontologists do not recognize a middle Carnian age zone (P. Huber, pers. comm. 1992): Basal late Carnian age assignments based on vertebrates overlap upper middle Carnian age assignments based on palynomorphs. T and overlying No-L palynofloras is one dominated by extinctions, most palynological taxa of late Carnian age are present in the middle Carnian. The only reliable way to correlate and age date the Triassic sequences of North America is through extensive sampling of every productive zone (ideally through coring), and by making as many 200+ counts as possible in order to track each and every diagnostic taxon through the section being studied. As good as palynology is in providing data for correlation, the relative amount of taxonomic change across the United States in the Triassic is comparable to that which exists today. Clearly, no one paleontological or geological method will give all the answers in every study. It will take an integrated effort between vertebrate paleontologists, paleobotanists, palynologists, stratigraphers, and magnetostratigraphers to give us the most probable correlations and age determinations possible for the Triassic of North America. I warmly thank P.E. Olsen for four years of support through at least two NSF grants that made various stages of data acquisition and analysis possible for this paper. I also thank the following companies and institutions that allowed me to collect and/or process the non-proprietary samples used in this study: Eastern Exploration, Inc., Exxon Company U.S.A., Geminoil, Inc., Geochem Laboratories, Inc., Gulf Research & Development Corp. (now Chevron), Lamont-Doherty Earth Observatory; The Pennsylvania State University, Southeastern Exploration and Development Co., and Superior Oil Co. (now Mobil). I also acknowledge Robert Jones, who processed the Horner and Bailey well samples, for his meticulous work. Ash, S.R., 1970, Ferns from the Chinle Fonnation (Upper Triassic) in the Fort Wingate area, New Mexico: U.S. Geol. Survey Prof. Paper 613D, p. 1-52. Ash, S.R., 1975, The Chinle (Upper Triassic) flora of southwestern Utah: Four Corners Geol. Soc., Guidebook, 8th Field Conference, p. 143-147. Ash, S.R., 1980, Upper Triassic floral Zones of North America, in Dilcher, D. and Taylor, T., eds., Biostratigraphy of fossil plants: successional and paleoecological analysis: Dowden, Hutchinson and Ross, Stroudsburg, p. 153-170. Ash, R., Litwin, R.J., and Traverse, A., 1982, The Upper Triassic fern Ph1ebopteris smithii (Daugherty) Arnold and its spores: Palynology, v. 6, p. 203-219. Cornet, B., 1977a, The palynostratigraphy and age of the Newark Supergroup, [Ph.D. thesis]: The Penn. State Univ., University Park, 506p. Cornet, B., 1977b, Preliminary investigation of two Late Triassic conifers from York County, Pennsylvania, in Romans, R.C., ed., Geobotany: Plenum Press, NY; p. 165-172. Cornet, B., 1986, The reproductive structures and leaf venation of a Late Triassic angiosperm, Sanmiguelia lewisii: Evol. Theory, v. 7, p.231-309. Cornet, B., 1989a, Angiosperm-like pollen from the Late Triassic Richmond rift basin of Virginia: Palaeontogr., v. 213B, p. 37-87. Cornet, B., 1989b, The reproductive morphology and biology of Sanmiguelia lewisii, and its bearing on angiosperm evolution in the Late Triassic: Evol. Trends in Plants, v. 3, p. 25-51. Cornet, B., 1989c, Richmond basin lithostratigraphy and paleoenvironments, in Olsen, EE. and Gore, EJ.W, eds., Field guide to the tectonics, stratigraphy, sedimentology, and paleontology of the Newark Supergroup, eastern North America: lnternat. Geol. Congl:, Field Trip Guidebook T351, p. 47-52. Comet, B., 1993, Dicot-like leaf and flowers from the Late Triassic tropical Newark Supergroup rift zone, U.S.A.: Modern Geol. v.19, p.81-99. Cornet, B., Traverse, A., and McDonald, N.G., 1973, Fossil spores, pollen, and fishes from Connecticut indlcate Early Jurassic age for part of the Newark Group: Science, v. 182, p. 1243-1247. Cornet, B., and Traverse, A., 1975, Palynological contributions to the chronology and stratigraphy of the Hartford basin in Connecticut and Massachusetts: Geosci. Man, v. 11, p. 1-33. Cornet. B., and Olsen, P.E., 1985, A summary of the biostratigraphy of the Newark Supergroup of eastern North America with comments on Early Mesozoic provinciality, in R. Weber; ed., Simposio Sobre Floras del Triassico Tardio, su Fitogeografia y Palecologia: Memoria, III Congresso Latinoamericano de Paleontologia, Mexico, p. 67-81. Cornet, B., and Olsen, P.E., 1990, Early to middle Carnian (Triassic) flora and fauna of the Richmond and Taylorsville basins, Virginia and Maryland, U.S.A.: Guidebook No.1, Virginia Museum of Natural History, Martinsville, 87 p.
Dunay, R.E., 1972, The palynology of the Triassic Dockum Group of Texas, and its application to stratigraphic problems of the Dockum Group [Ph.D. thesis]: The Penn. State Univ., University Park, 370 p.
Dunay, R.E., and Traverse, A., 1971, Preliminary report on Triassic spores and pollen of the Dockum Group, Texas panhandle: Geosci. Man, v. 3, p. 65-68. Dunay, R.E., and Fisher; M.J., 1974, Late Triassic palynofloras of North America and their European correlatives: Rev. Palaeobot. Palynol., v. 17, p. 179-186. Dunay, R.E., and Fishel; M.J., 1979, Palynology of the Dockum Group (Upper Triassic), Texas, U.S.A.: Rev. Palaeobot. Palynol., v. 28, p. 61-92. Ediger; V.S., 1986, Paleopalynological biostratigraphy, organic matter deposition, and basin analysis of the Triassic-Jurassic(?) Richmond rift basin, Virginia [Ph.D. Thesis]: The Penn. State Univ., University Park, 547 p.
Fisher, M.J., and Dunay, R.E., 1984, Palynology of the Petrified Forest Member of the Chinle Formation (Upper Triassic), Arizona, U.S.A.: Pollen et Spores, v. 26, p. 241-284. Fowell, S.J., Cornet, B., and Olsen, P.E., in press, Gradual or catastrophic Late Triassic extinctions? Palynological evidence from the Newark Supergroup: G.S.A. Bull. Gottesfeld, A.S., 1971, Paleoecology of the Chinle Formation in the Petrified Forest National Park, Arizona [M.S. thesis]: Univ. Arizona, Tucson, 87 pp. Gottesfeld, A.S., 1972a, Palynology of the Chinle Formation: Museum Northern Arizona Bull., v. 47, p. 13-18. Gottesfeld, A.S., 1972b, Paleoecology of the lower pad of the Chinle Formation in the Petrified Forest: Museum Northern Arizona Bull., v. 47, p. 59-73. Gottesfeld, A.S., 1975, Upper Triassic palynology of the southwestern United States [Ph.D. thesis]: Univ. California, Berkeley, 219 pp. Gottesfeld, A.S., 1980, Upper Triassic palynofloras of the western United States: Proc. IV into palynol. conf., Lucknow (1976-1977), V. 2, p. 295-308. Gottesfeld, A.S. and Kremp, G.O.W., 1966, Paleoecological studies of the microflora of the Chinle Formation (Upper Triassic), Petrified Forest National Park, Arizona: Abstr. Ann. Meet., Geol. Soc. Am., p.79. Jansonius, J., 1962. 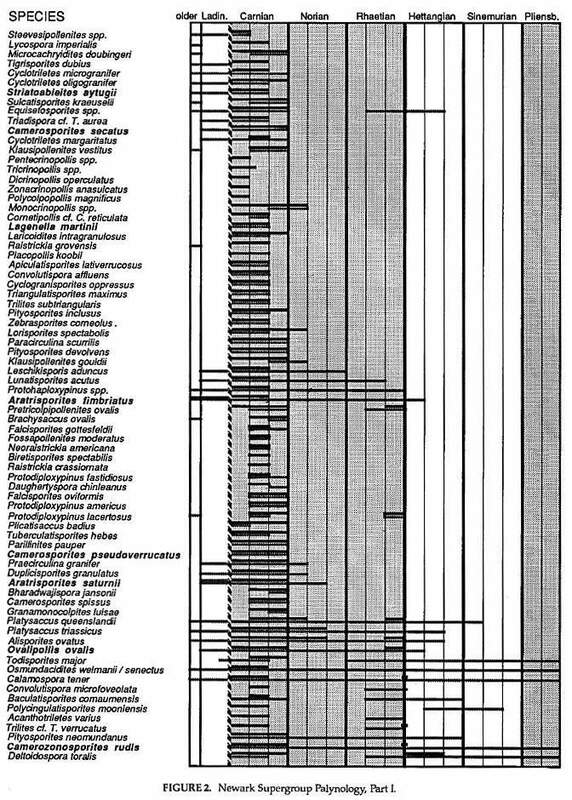 Palynology of Permian and Triassic sediments, Peace River area, Western Canada: Palaeontogr., V. 110B, p. 35-98. Koob, JD., 1961, Triassic pollen and spore flora of the Cumnock Formation (Newark Series) of North Carolina [M.A. thesis]: University of Massachusetts, Amherst, 47 p.
Litwin, R.J., 1985, Fertile organs and in situ spores of ferns from the Late Triassic Cheinle Formation of Arizona and New Mexico, with discussion of the associated dispersed spores: Rev. Palaeobot. Palyno)., V. 44, p. 101-146. Litwin, R.J., 1986, The palynostratigraphy and age of the Chinle and Moenave Formations, southwestern U.S.A. [Ph.D. thesis]: The Penn. State Univ., University Park, 265 pp. 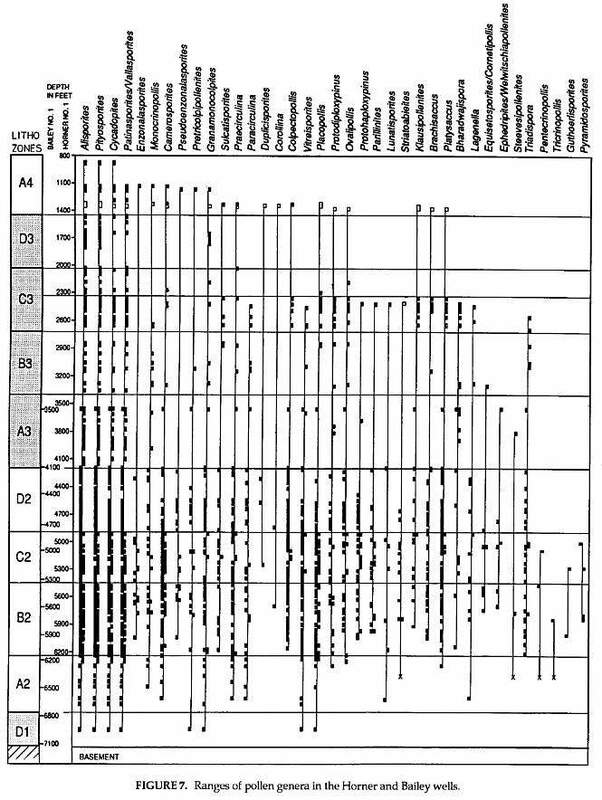 Litwin, R.J., and Ash, S.R., 1993, Revision of the biostratigraphy of the Chatham Group (Upper Triassic), Deep River basin, North Carolina, USA. Rev. Paleobot. Palynol. V. 77, p. 75-95. Litwin, R.J., and Weems, R.E., 1992, Reevaluation of the age of Triassic strata (Doswell Formation) of the Taylorsville Basin, VA.: VA Journ. Sci., V. 43, p. 265. 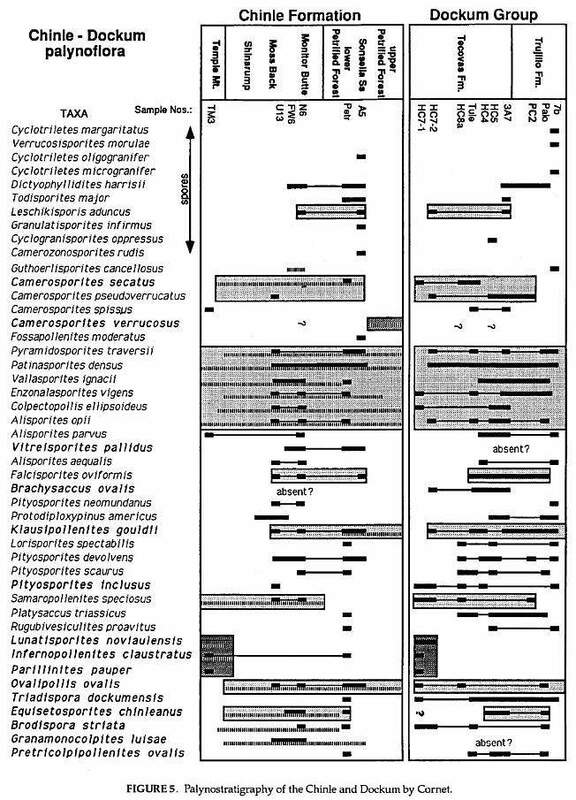 Litwin, R.J., and Skog, J.E., 1991, Morphology and palynostratigraphy of the genus Camerosporites Leschik 1956: Palynology, V. 15, p. 5-28. Litwin, R.J., Traverse, A., and Ash, S.R., 1991, Preliminary palynological zonation of the Chinle Formation, southwestern U.S.A., and its correlation to the Newark Supergroup (eastern U.S.A.): Rev. Palaeobot. Palynol., v. 68, p. 269-287. McGregor, D.C., 1965, Illustration of Canadian fossils, Triassic, Jurassic and Lower Cretaceous spores and pollen of Arctic Canada: Geol. Surv. of Canada, pap. 64-55, p. 1-32. Moy, C., and Traverse, A., 1986, Palynostratigraphy of the subsurface Eagle Mills Formation (Triassic) from a well in east-central Texas, U.S.A.: Palynology, v. 10, p. 225-234. Olsen, P.E., 1986, A 40-million-year lake record of early Mesozoic climatic forcing: Science, v. 234, p. 842-848. Olsen, P.E., and Cornet, B., 1988, The Triassic-Jurassic boundary in eastern North America: Global Catastrophes in Earth History. Lunar and Planetary Inst. - Nat. Acad. Sci., Symp, Snowbird, p. 135-136. Olsen, P.E., and Galton, P.M., 1977, Triassic-Jurassic tetrapod extinctions: are they real? : Science, v. 197, p. 983-986. 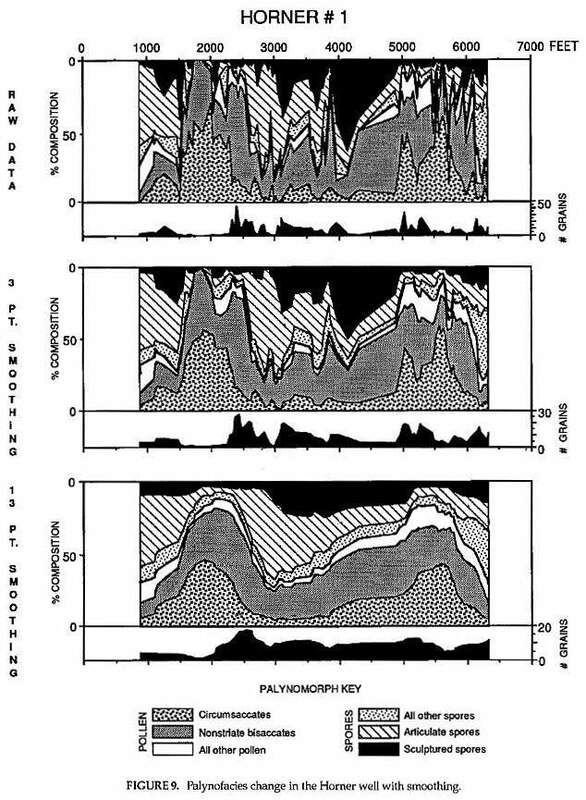 Olsen, P.E., Cornet, B., and McDonald, N.G., 1989, Cyclosptratigraphy of the Chicopee fish bed and adjacent strata: implications for the palynostratigraphy of the Portland Formation (Early Jurassic, Newark Supergroup): Geol. Soc. Armer., Abst. Progr., v. 21, p. 56. Olsen, P.E., Remington, C.L., Cornet, B., and Thomson, K.S., 1979, Cyclic change in Late Triassic lacustrine communities: Science, v. 211, p. 729-733. Olsen, P.E., Schlische, R.W., and Gore, P.J.W. (and others), 1989, Field guide to the tectonics, stratigraphy, sedimentology, and paleontology of the Newark Supergroup, eastern North America: Internat. Geol. Congr., Guidebooks for Field Trips T351, 174 pp. Olsen, P.E., Fowell, S.J., and Cornet, B., 1990, The Triassic/Jurassic boundary in continental rocks of eastern North America; a progress report: Geol. Soc. Amer., Spec. Paper 247, p. 585-593. Olsen, P.E., McDonald, N.G., Huber, E, and Comet, B., 1992, Stratigraphy and paleoecology of the Deerfield rift basin (Triassic-Jurassic), Newark Supergroup, Massachusetts, in Robinson, E. and Brady, J.B., eds., Guidebook for field trips in the Connecticut valley region of Massachusetts and adjacent states, NEIGC Contrib. No. 66, p.488-535. Peterson, F., Cornet, B., and Turner-Peterson, E.C., 1977, New data bearing on the stratigraphy and age of the Glen Canyon Group (Triassic and Jurassic) in southern Utah and northern Arizona: Geol. Soc. Amer. Abst. Progr. v. 9, p. 755. Reyre, Y., 1973, Palynologie du Mesozoique Saharien: Memoires du Museum National d'Histoire Naturelle, Series C, v. 27, 284 p.
Robbins, E.I., 1980, "Fossil lake Danyille": the paleoecology of the Late Triassic ecosystem on the North Carolina-Virginia border [Ph.D. thesis]: The Pennsylvania State University, University Park. Robbins, E.I. and Traverse, A., 1980, Degraded palynomorphs from the Dan River (North Carolina)-Danville (Virginia) basin, in Price Jr., v:, Thayer, P.A., and Ranson, W.A., eds., Geological investigations of Piedmont and Triassic rocks, central North Carolina and Virginia: Carolina Geological Society Field Trip Guidebook, p.1-11. Schulz, G. and Hope, R.C., 1973, Late Triassic microfossil flora from the Deep River basin, North Carolina: Palaeontographica, v. 141B, p. 63-88. Shaler, N.S. and Woodworth, J.B., 1899, Geology of the Richmond basin, Virginia: U.S. Geological Survey Annual Report 19, p. 385. 515. Srivastava, S.K, 1987, Jurassic spore-pollen assemblages from Normandy (France) and Germany: Geobios, v. 20, p. 5-79. 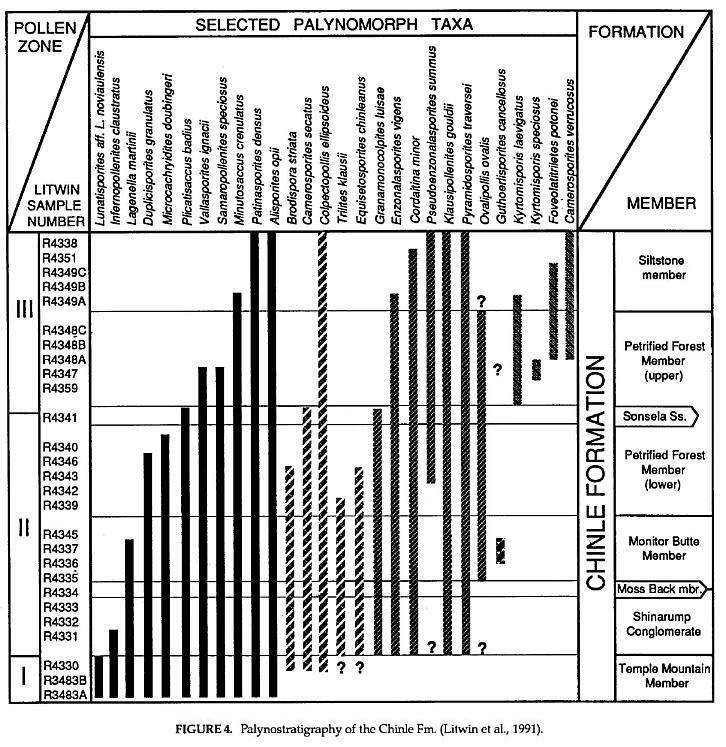 Taylor, N.T., Delevoryas, T., and Hope, R.C., 1987, Pollen cones from the Late Triassic of north America and implications on conifer evolution: Rev. Palaeobot. Palynol., v. 53, p. 141-149. Traverse, A., 1986, Palynology of the Deep River basin, North Carolina, in Gore, P.J.W., ed., Depositional framework of a Triassic rift basin: the Durham and Sanford sub-basins of the Deep River basin, North Carolina: Field trip #3, The Soc. Econ. Paloont.and Minerol., Raleigh, N.C., p. 66-71. Traverse, A., 1987, Pollen and spores date origin of rift basins from Texas to Nova Scotia as Early Laate Triassic: Science, v. 236, p. 1469-1472. Witte, WK., Kent, D.V., and Olsen, P.E., 1991, Magnetostratigraphy and paleomagnetic poles from Late Triassic-earleist Jurassic strata of the Newark basin: Geol. Soc. Am. Bull., v. 103, p. 1648- 1662. Zavada, M.S., 1990, The ultrastructure of three monosulcate pollen grains from the Triassic Chinle Formation, western United States: Palynology, v. 14, p.41-51.